Yellow fever Reactive Vaccination in Zamfara state, north-western Nigeria. This drive is part of a global effort to eliminate the risk of yellow fever epidemics by 2026, which should be possible if 90 per cent of the population can be reached. The preventive campaign will use vaccines funded by Gavi, the Vaccine Alliance, and will also be supported by the UN Children’s Fund (UNICEF). The yellow fever virus is mosquito-borne, and the disease can cause jaundice due to liver damage. Nigeria’s current yellow fever outbreak began in September, and by early January this year, a total of 358 suspected cases had been reported, with 45 deaths. 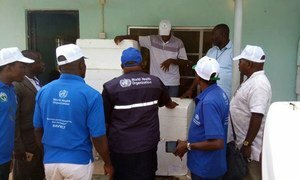 In late 2017, Nigeria vaccinated more than three million people in an initial emergency yellow fever campaign, with the aim of quickly containing the outbreak. However, the virus continues to spread in parts of the country where people remain largely unprotected. WHO is supporting the campaign by training thousands of healthcare workers, helping to track cases, and by providing coordination and logistical support. Bronwen Cowley of UN News spoke to WHO Spokesperson Christian Lindmeier, for the latest. AUDIO: WHO Spokesperson Christian Lindmeier provides an update on the health organization's support to the campaign. A 10-day campaign launched by the Government of Nigeria will immunize nearly 874,000 people against yellow fever in the states of Kwara and Kogi, according to the United Nations health agency.